Finally had a little time to take a photo of more loom work. This is very addictive! 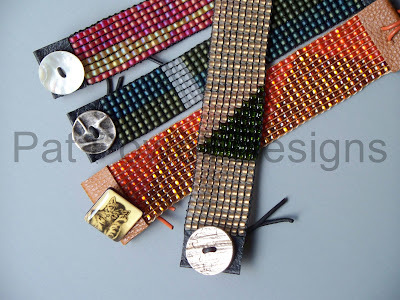 Just need a design to pop into your head (usually based on the beads you have at hand), warp up the loom and start weaving. It’s really great to do while you’re watching TV. I really need to take a break from this and do more geometric beading but we’ll see what wins out in the next day or so. Last Saturday I had a great time leading the activity (braided tassels) at the Center for Contemporary Craft. All our guests seemed to enjoy it also. Next month there will be lots of fiber related activities there. It should be fun. This week I’ll be one of four doing a short presentation for the Houston Area Fiber Artists. My bit will be on kumihimo, how its done and how I use it to create my neckpieces. Looking forward to it.